The conservation project is led by Spanish scientists. Spain sees the conservation of Cabo Blanco colony of monk seals a priority as the species was once common off its coasts. 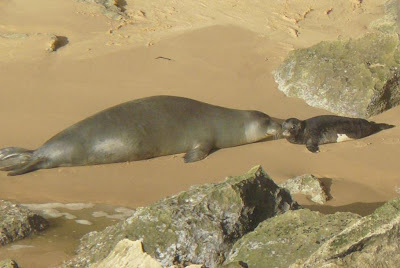 A small group of monk seals survived in Cabo de Gata, Almeria until the 1960s. In 2009, for the time in 50 years a Monk seal was spotted off coast of Mallorca. The Cabo Blanco colony saw the birth in 2008 of 46 pups, practically the same as in 2006, and doubling those of previous years. The colony is now made up of 180? individuals of which some 50 are breeding females, demonstrating that it is finally beginning to recover from the mass epidemic caused by a toxic seaweed of the late 1990s which killed off 75% of the colony.